It's time to add Japan to your travel bucket list—that is if it isn't already. Everyone from travel bloggers to travel editors have named this country as a must-see destination for 2019 and it seems as though its popularity as a vacation spot will only continue to gain momentum. If you talk with someone who's already visited the country multiple times, it's easy to see why. "Japan is a country rooted in tradition and dedication for a life lived with passion and care that emanates contagious energy," explains Jessica Wright, the travel blogger behind Bon Traveler. "This matched by their genuine friendliness and consideration for the other, it creates a peacefulness amidst what could easily be chaos," she continues. The travel pro also describes the energy of the country as a reason why Japan is such a special travel destination. "You can sense this energy when you pass through historic temples or sit down to a traditional kaiseki dinner... It’s this kind of visceral feeling," Wright says. There's no doubt that Japan deserves a spot on your bucket list, but why has it seemingly taken over as a trendy place to visit all of the sudden? Wright points out two reasons for this surge in interest. First of all, Japan has long been an expensive travel destination, but that's changed in recent years. "With flights being more cost-effective, alternate choices for accommodations, and an arrangement of dining options, it’s more wallet-friendly now," she states. Secondly, Wright thinks that taking on the task of planning a trip to the country may seem less intimidating now thanks to an influx of content featuring the location. "I find myself seeing more digital content from Japan in the past two years than before," she says. "It reduces the 'how do I plan a trip to Japan' stress when you see other travelers sharing about their experiences," the world traveler continues. If you're planning your next big adventure and don't know where to start, consider this your ultimate Japan itinerary. Ahead, Wright gives you the inside scoop on where to stay, eat, and play in Japan. 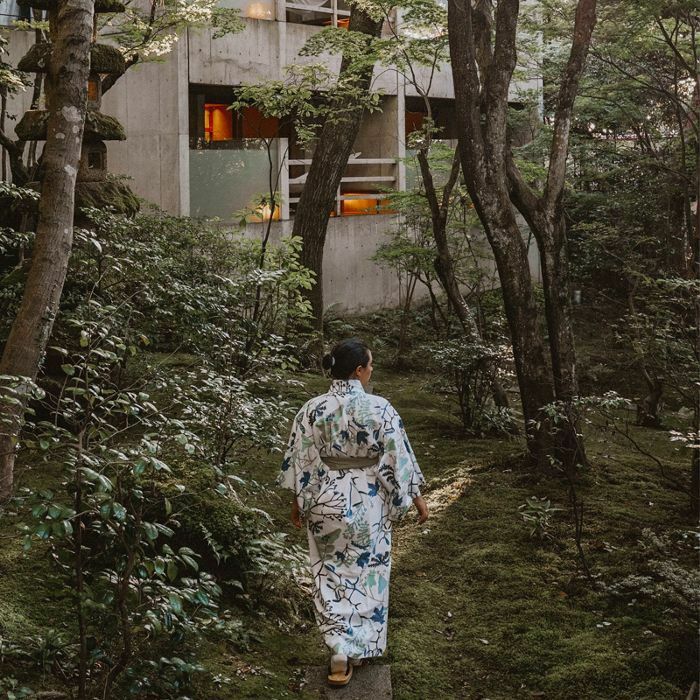 Located outside of Kanazawa in the Yamashiro area, Beniya Mukayu exudes Japanese tradition. You'll be dressed in yukatas (Japanese robes) during your stay at this Relais & Chateaux property for an immersive experience. Japanese philosophy also plays a role in the hotel's accommodations. According to the hotel's website, the word "Mukayu" translates to "non-existence" and plays into the idea that empty things, such as free time in your calendar, may be the most meaningful. If you're looking for a rejuvenating stay in a beautiful location, this is the place to go. For a memorable stay, the travel pro also recommends The Ritz-Carlton Kyoto. It was recently named one of the top hotels in Japan by Condé Nast Traveler and for good reason. Here, it's all about "quiet luxury." You'll enjoy unbeatable views, relax with spa rituals inspired by Japanese traditions, and be walking distance from some of Kyoto's best shopping and entertainment districts. Aman Tokyo is Wright's top choice for a hotel in Tokyo. For modern and sophisticated accommodations in the heart of the city, this is definitely the place to book. It's located in the financial district and offers beautiful views of the Imperial Garden, Tokyo Skytree, and Mount Fuji. Of course, there's also an impressive spa and many fine dining restaurants to choose from. "My favorite thing to do in Japan is to dine," Wright admits. She recommends Fuku, a yakitori spot, if you're looking for something intimate and upscale. It's located in Tokyo and specializes in grilled chicken made with traditional methods. "What I love most is that restaurants specialize in a style of food," she adds. "Dining in Japan is captivating," according to Wright. For unparalleled seafood-inspired dishes, she suggests heading to Kaikaya by the Sea in Tokyo. The fish comes straight from Sagami Bay for seafood that's just about as fresh as it gets. The style is also described as East meets West thanks to the owner and chef's fusion of Asian and western food. If you're in Kyoto, visit Chao Cho Sanjo Kiyamachi for the best gyoza—fried dumplings traditionally stuffed with pork and cabbage—in town. It's a small spot that's sure to be busy no matter when you stop in. This leads Wright to one of her best travel tips for people heading to Japan. "Utilize hotel concierge to help book dining experiences," she says. Since reservations are needed at most restaurants, you can rely on your hotel to assist you in getting a spot. Wright suggests venturing outside of the city to experience the Kiso Valley. Once you're there, book a stay in a traditional ryokan and get outdoors for a stunning hike. The travel blogger recommends hiking the historic Nakasendo Trail through the forest that connects towns like Tsumago and Magome to get the most out of your experience. In Kyoto, a walk down the Philosopher's Path is a must. "It's great right before sunset as the crowds usually die down," Wright explains. "You will work your way down a stone path with a cherry-tree-lined canal, sprinkled with boutiques, pottery stores, and a few restaurants," she continues. Next Up: The 6 international destinations travel experts want you to explore in 2019.